Cyber Monday is an event, but do you know why we celebrate it? Cyber security is a must for all Internet users and not something anyone can afford to avoid. 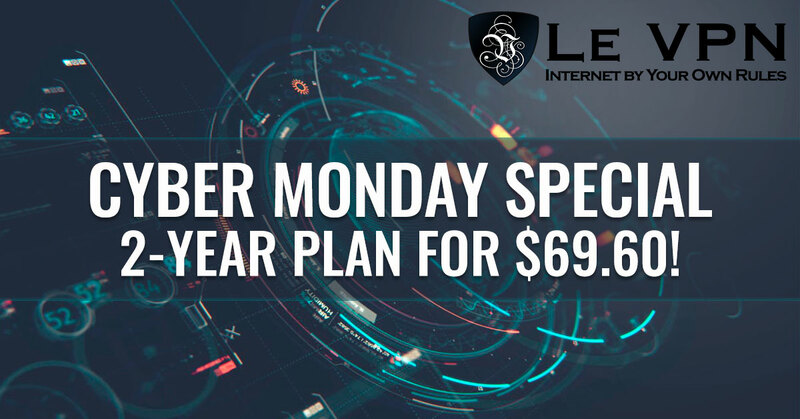 Take advantage of Le VPN Cyber Monday Special: 2-year plan at only $69.60! Cyber Security, Internet Security, IoT Security. In today’s world they are one and the same. Our devices, our phones, our cars, homes, work places and even our clothes have become connected together in a way that has erased borders and brought the world together but has also opened a Pandora’s Box of threats. If you don’t believe me, consider this. Symantec reported that the number of new and unique pieces of malware has risen 36% in the last year to over 430 million. That’s 430 million NEW viruses on top of the 280 odd million that were created the year before, and all the ones created the years before that. Needless to say, that is a lot of viruses and they don’t even represent the full scope of threats faced by today’s Internet user. Among the more common are targeted attacks intended to shut down businesses and/or the Internet at large, smartphone threats, social media scams and Internet of Things vulnerabilities. Internet security is all about information security. It is the sum total of devices, software and practices you use to maintain the integrity of your devices, the local network (home, office, factory or other) and the safety of your connections and the data you send across them. Obviously, you need to use some sort of malware or virus protection such as Symantec, Avast, Pcmatic or MalwareBytes but this is not the end of the story. In addition to this, you need to use firewalls, secured connections, Internet Best Practices and most importantly VPN’s. If all the rest can be considered to be bricks in your wall of computer security then VPN is the mortar that holds that wall together. How VPN keeps security is actually kind of cool. It is a combination of two distinct methods of security that come from the private sector and the US military. The technology is simple and its use even more simple, at least today and only after years of development. Software installed on your computer or device works to encrypt and encapsulate your data packets (the method by which information is transferred across the web) so that they are anonymous and unreadable. Then it is routed through a dedicated VPN server using a tunneling protocol that keeps the connection invisible to prying eyes and gives the added bonus of masking and replacing your IP address. What you get is a connection that is secure, invisible and encrypted that can be used over any Wifi network, public or private. The added bonus is that by masking your IP address you will also be able to avoid geo-targeting and unlock geo-restricted content. Why we celebrate Cyber Monday really has nothing to do with computer security but it is an example of why cyber security, including mobile security, is so very important. Cyber Monday is the first Monday after Thanksgiving and a day in which Internet retailers around the world offer up massive deals in advance of the holiday season. In 2015 sales on Cyber Monday rose 23% over 2014 to just under $3.2 BILLION dollars, it was one of the busiest days for the Internet that year. The downside is that all this consumerism attracts lots of threats, all of which can be avoided by implementing a full-scale security scheme that includes VPN. Le VPN is the leading provider of VPN technology for consumers offering VPN apps for Android, iOS, Windows, mac and other devices, and supporting 3 distinct VPN protocols and contributing significant value to the cyber security value chain. Its service can be used on desktop, laptop, mobile or tablet and across any connection be it at home or a public WiFi hot spot.The need is clear, the solution is clear, get Le VPN. During the whole Cyber Monday week Le VPN is running a special Cyber Monday promotion: 2 years of Le VPN service for only $69.60! Don’t wait and take advantage of it now!